Price: $300. Contact afrevapens@gmail.com to purchase this pen. 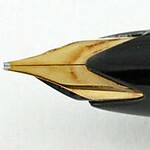 Montblanc 14 (1950-54) PF Black Resin. Cardinal cap. GFT, clear barrel window. Nib; medium Partially hooded nib. Fine-Med with responsive semi flex. Price: $300 Measures: 5- 7/16" (137 mm). Condition: Extra fine. Excellent, quality pen for daily use.